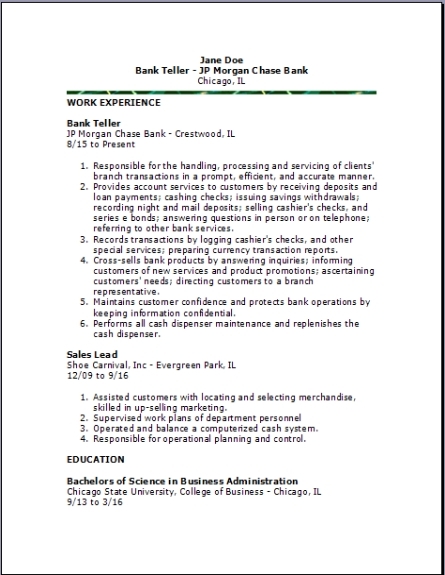 These are some of my bank teller resume formats I created for use myself. I really like the original look to them. They all have a great look, but don't over due in any of their features in design. To download a template--click save--save in Desktop-- leave the file name. Add this site to your favorites please for your future, do it now. A bank teller position offers the flexibility of part time work. Although with most positions you will work weekdays, if you so desire part time work, most banks love part timers, and make good use of them during the busiest parts of the day. Great communication with customers is what makes a great teller. Most people leave the bank with that last impression of who they just did business with. So leaving the customer with a good impression of the bank you work for is a vital talent to have. To sum the job up you need a high level of concentration for the specific things and small details. You need to be able to stand for long periods. You will also need to be very good at math very quickly. 1. Have the ability to perform customer transactions competently. 2. Balance your cash drawer at the end of the day. 4. Referring bank services to customers when asked about bank programs. 6. Accept loan payments, auto or mortgage payments. Open savings accounts and checking accounts for new customers. 7. Help customers with online banking instructions best they can. 8. Issue Certificates of Deposit, or CD's. 9. Interact with the customer in a friendly way. As a bank teller you must be comfortable handling large quantities of cash daily. Most banks prefer to hire people with customer service skills plus cash handling experience. Attention to detail is a must. Get started today while you are here. It's easy. 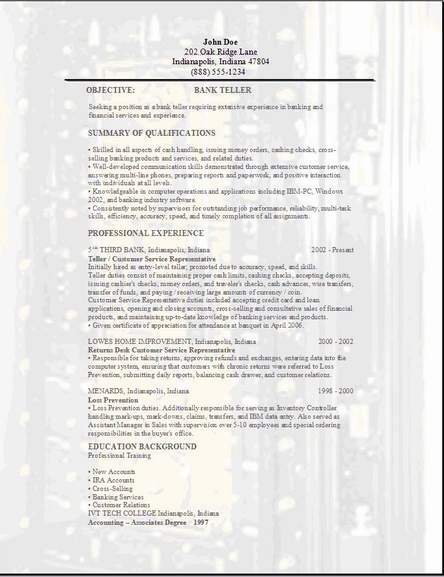 Just backspace and enter your own information in the pre-formatted bank teller resume example. These templates do make editing very easy, and the categories stand out, managers won't have to look too hard to find what they are after. 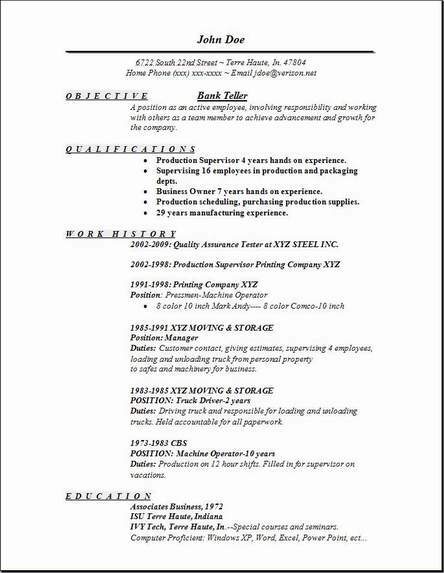 Once you edit this resume with all of your own job information, you will have created a great resume on your own. I hope you find these useful. I hope you get the job you are searching for too. If you find this website useful then send your friends by book marking this page, and leave some comments on the contact us page if you want to make some suggestions for adding more things to this website. I hope these teller resumes are found to be of some help to you. Add us to your favorites and tell some of your friends about us. After you edit your new teller resume, look around and get all the information you can from this site. Visit all the pages to get more ideas for your resume.